Design for your existing players not just new ones! 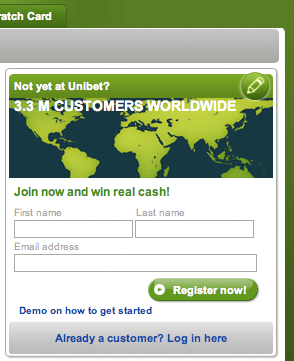 Today I signed up again at Unibet.com wanting to go over their registration process. The registration flow went smoothly. I just got a little confused when I submitted a username already taken, then I expected that the cursor would be in the username field but it was in the first field so I had to retype my firstname and then move to the username field insted. To me this gives the impression that they want many new players but don’t think so much about their current players. I continued and signed up, in Image 2 you see the login box. After looking around the portal for a while I decided to log out and go for my run. 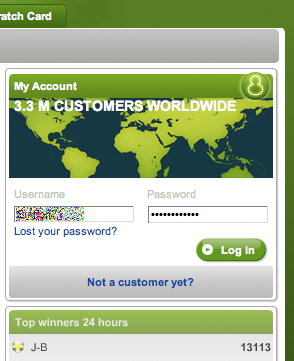 When I got back I started up my computer again and went to Unibet.com expecting to see the login box this time. But to my surprise I got the same registration box as I did the first time. Unibet could very easily remember that I’ve already signed up and present the log in box insted of the registration box. With this design implementation it takes a longer time for your players to do what they came to your portal to do, play!